A rustic floor tile with the look of Indian Slate, Tajah lends a casual air to any interior space. 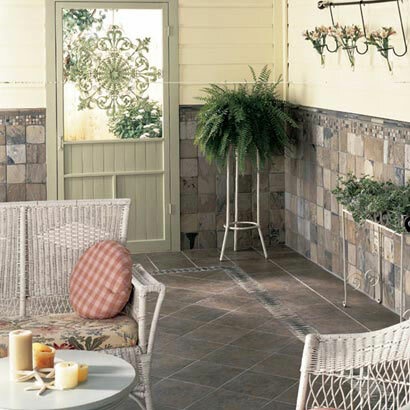 Each tile is randomly glazed to create a high degree of variation in both color and veining. The uniqueness of each tile is further accentuated by a clefted surface. Tajah comes in 12" x 12" and 18" x 18" sizes, which can be combined with multi-colored natural slate borders to create stunningly beautiful floors.